Is UK-LotterySyndicate a Scam or Legit? Read 8 Reviews! 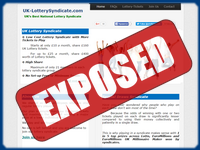 If you are looking for syndicates for the UK National Lottery and EuroMillions, you might like to take a look at UK-LotterySyndicate.com and they say anyone can play. You don’t have to be from or in the UK. This is an online lottery syndicate provider that uses the ole system of one standard ticket line and all the different bonus balls available for each syndicate. Okay, that’s all pretty straightforward. What makes this site a little different is how they split up the winnings. Syndicates at UK-LotterySyndicate.com are for the UK National Lottery weekly and UK EuroMillions when they add a bonus or “promotion” draw. UK EuroMillions adds a guaranteed five (minimum) 1 million dollar draws on the last Friday of each month. UK-LotterySyndicate.com figures that this increase in the odds is worth the gamble. They also use the system of one standard line of lottery tickets using each of the bonus balls available. Each syndicate shares lottery tickets to the value of £80. There is a maximum of 21 shares in each syndicate. If a syndicate is not full, UK-LotterySyndicate.com buys into that syndicate to make up the difference. For the cost of £5 per month, players can buy one share. If a player decides to play for more, then each additional £5 buys into a different syndicate. In UK-LotterySyndicate’s own words “£10 a month=£160 lotto tickets, £15=£240 lotto tickets, etc.” Ticket numbers for each syndicate is posted on their website. Okay – this was a little difficult to get our heads around. For winnings more than £1,000, 80% of the prize goes to the syndicate who owns the ticket (s) and this is divided by 21 shares. The other 20% goes to all the lottery groups. For prizes of £1000 or less, the winnings are allotted to all syndicates, and then divided by 21 shares in each. Then they get into something about non-cash prizes that “stay with the group who has the winning ticket until it is converted or wins a cash prize”. This is a trip for two to some exotic port – like the Manta Resort off the coast of Tanzania. I’m not sure how they figure this is going to be ‘converted’. Winnings are posted to individual accounts in the middle and the end of the month and this is when it gets a little strange. They also say they calculate total winnings each month and then individual shares every three months, though earlier if there is a mega win. Syndicate members can draw winnings when they are £10 or more, with no commission, but fees/bank charges if applicable. Guide2lotto Ltd. is the registered owner of UK-LotterySyndicate.com based in Newcastle-Under-Lyme in England. They offer a snail mail and email address, and text service. No other phone numbers. There is also an online form. My biggest issue is the fact that I’d get pretty annoyed if our syndicate numbers used on the Mega Friday draw for EuroMillions actually turned up as that mega winning ticket on the other draws during the month. The team also struggled a bit on the whole timing of the calculation of winnings. UK-LotterySyndicate.com gets a thumbs down. I personally don’t agree with the system they use plus I’d want at a minimum all EuroMillions draws played. If you are playing here, please give us some feedback on how you are doing! I used to play the lottery syndicate until I moved to Ireland. We got the tickets before the draws, the winnings were average and response are great. The only problem is bank transfer was no longer an option out of UK and Skrill is not a good payment option (my opinion only). Will join again though once I get established in Britain again few years down the line. I got a call saying I had won 10 free lines on Friday nights lottery. But to claim it, I had to join a syndicate which gave me.75 lines, which be discounted by 75 percent. Um, I thought sounded good, but then I thought no one gave you that many lines for 25 pounds do I didn’t bother. I joined in October 2017, and check the account regularly, and the balance on the account said £41.00. Wait till you try and get your so called 39.00 pounds back by a scammer called Kirsten who is a South African. Need I say more. There is something to be said where everyone actually wins. The only problem there is that it means – probably – it won’t be a lot. I have to read the winning part several times before I got it. Not sure if I am going to play this one but it is cute and theoretically, there is a good chance to win something! I have been playing with this syndicate for a while and it surprised me that so many are commenting without even being actually a member of the syndicate. Denise – there is no login in the syndicate. All the details are available without login. £41 in 60 days! We don’t even win that much even with the maximum of £25 a month. The returns in lottery are low unless jackpot is won. Magpie – It is a pay and play syndicate. You don’t get free tickets especially if you are not paying. Anyway, it is true that winnings are not much. But no one wins much unless jackpot happens.